He was wrong. Start the Presses reminds us why one of the country’s oldest and Detroit’s first 60’s era underground paper was so special and why, 50 years after its creation, we still remember. The underground press were hip, exciting, angry, iconoclastic newspapers that gave full-throttle coverage to the growing counterculture, anti-Vietnam War, civil rights, gay and women’s rights movements. Some underground papers lasted only a few months, others a few years. But a half-century after its creation, Detroit’s Fifth Estate still rolls. When he wasn’t working at L.A.’s underground paper, the Los Angeles Free Press, Harvey hung out upstairs at the Fifth Estate coffee house where he dreamed about returning to Detroit and publishing his own newspaper. But Detroit wasn’t like Los Angeles. The Fifth Estate‘s first issue was delayed by a month when a commercial printer refused to print the paper because of its “unpatriotic” content. The main concern was a political cartoon that portrayed an American flag with rifles and bayonets as its stripes. Finally, Reverend Albert Cleage, Jr., a black nationalist minister, and his brother Henry, publishers of their own newspaper, agreed to print the issue. In November 1965, the Fifth Estate was born. The paper was soon discovered by young anti-war activists and others in the vibrant arts, radical politics and student community centered around the Warren Forest area of Wayne State University. Detroit Artists Workshop’s John and Leni Sinclair enthusiastically began to write and shoot photographs for the paper. John’s Fifth Estate “Coat puller” column chronicled the new and innovative works of area poets, artists and musicians. Leni’s now iconic photos graced its pages. In its reporting, the paper practiced what it called “engaged journalism.” Fifth Estate writers would often return from anti-war demonstrations nursing bruises from police truncheons and with tear gas still clinging to their clothes to write about the event. Fifth Estate staffers, many barely out of high school, also reported on local civil rights protests, the growing feminist and sexual liberation movements and on-scene coverage of what the paper described as the 1967 Detroit rebellion. An early Fifth Estate innovation was its colorful calendar of events, a popular feature that eventually became standard in both the alternative and mainstream press of the next decades. Unless they were in trouble, young people and African Americans were largely invisible in the local mainstream press of the early 1960s. Stories about women were mainly quarantined to the society pages. The Fifth Estate helped change all that. 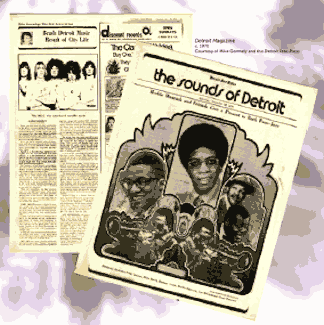 The paper’s coverage of local anti-war, civil rights and feminist issues, combined with its reporting on Detroit’s youth and counterculture, soon became required reading for reporters at the Detroit Free Press and Detroit News. At the Freep, editors took a cue from the Fifth Estate and hired a rock writer. The News even started its own underground newspaper section aimed at young readers. 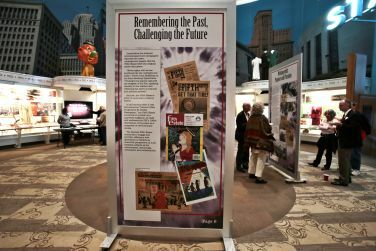 Under the art direction of the Grande Ballroom poster artist Gary Grimshaw, with additional contributions from area illustrators and artists, the Fifth Estate began to influence the layout and “look” of the city’s two dailies. Soon, both papers began printing stories with a combination of type styles and margins. Photographs were laid out in a variety of shapes. Perhaps most radical of all, color was added to the (daily press run of the two mainstream papers. Long before the Internet revolutionized how newspapers reported the news, underground papers like the Fifth Estate were the original media disrupters. And yet, the Fifth Estate’s story is more than a history lesson. 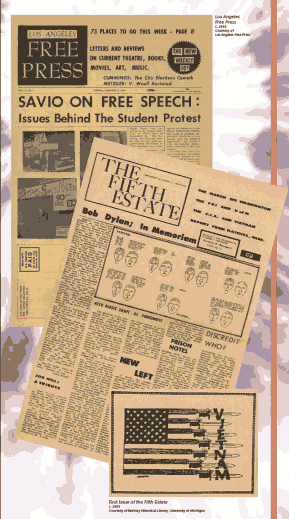 A half century after it was introduced as “Detroit’s New Progressive Biweekly Newspaper,” the Fifth Estate continues to publish as a quarterly magazine, its staff still embraces the FBI’s 1960s description of the paper as a supporter of revolutionary causes. 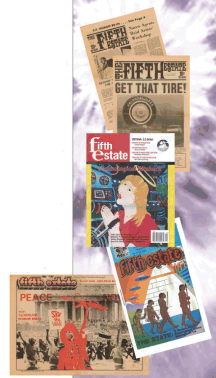 The fearless Fifth Estate continues to engage and provoke, offering a new generation of readers an anarchist perspective on such timeless subjects as the environment, technology, civilization and industrialism.